Such a cute diaper cake!! 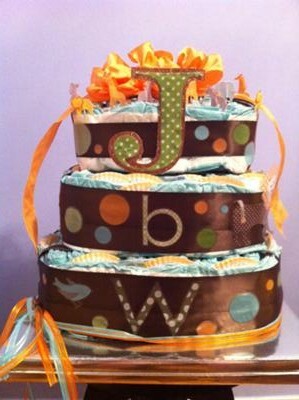 We love the colors and the decor that Elisabeth used to make this diaper cake. Elisabeth submitted her diaper cake to our website to inspire the rest of us with her creativity! So delightful! Thanks Elisabeth for your cute cake! I made this square diaper cake using diapers that had a color that actually matched the color of the nursery decorations. it was a lot of fun. The ruffles in the cake are actually folded cupcake liners. nice article for cake lovers. we are offering best academic writing services visit www.academicwritingweb.com. Love the cake and planning to make it for a baby shower in Silver Spring MD. Great cake! Great post full of useful tips! Very good choice of colors and use of creative ideas. Every diaper cake tells a story and this one looks to be a very fun and colorful one! Great info! I recently came across your blog and have been reading along. I thought I would leave my first comment. I don’t know what to say except that I have visited this page 4 days in a row! Has given me such great ideas! Join in and write your own page! It's easy to do. How? Simply click here to return to Diaper Cake Invitation.